Here at Cat Cams NV, were always looking to make things better. To improve. To go beyond standard, to deliver the performance that you desire and deserve. Hence why Cat Cams NV is pleased to launch a set of no-compromise fast road sport profiles for the Peugeot 206 GTi 180, which uses the 1997cc EW10J4S engine. Designed to deliver a noticeable gain in performance throughout the rev range, while retaining everyday usability, Cat Cams technicians have analysed the valvetrain in the 180s VVT engine and produced a pair of camshafts that are significantly better in every respect. Cat Cams is the only cam designer offering profiles for the 206 GTi 180. Why? Because the EW10J4S engine incorporates variable valve timing (VVT) on the inlet cam, meaning that Cat Cams NV has to produce the inlet profile from steel billet, while the exhaust cam is manufactured from a chill cast blank. This makes it relatively difficult to produce, but once again, Cat Cams has risen to the challenge! Back to back dyno testing conducted by Peugeot specialist Pug1off at Northampton Motorsports chassis dyno confirmed that in conjunction with an ECU remap, the Cat Cams Sport 4901804 profiles for the 206 GTi 180 gain power and torque throughout the rev range, from just 2750 rpm upwards. Peak power increases by 14 bhp at 7250 rpm, with gains of 17-18 bhp over standard between 6000-7000 rpm. Even at just 3000 rpm the Cat Cams pick up over 10 bhp, highlighting the road friendly nature of the cams design. 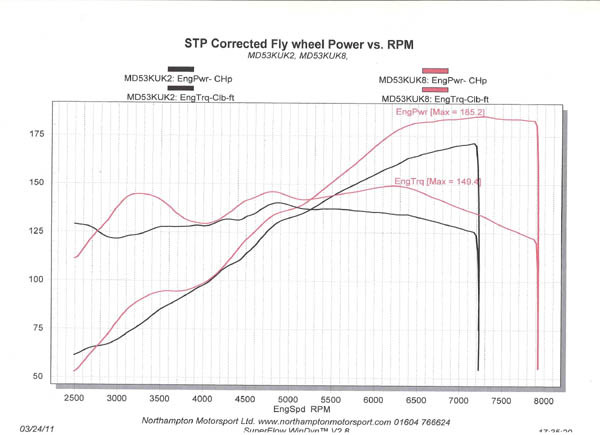 Crucially, for a fast road cam profile, the 206 GTi 180s torque curve transformed too by Cat Cams work, with gains of 20 lb.ft at 3250 rpm and a peak gain of 10 lb.ft. But the numbers only tell half the story, as the shape of the torque curve is transformed, making the engine feel much more eager, particularly at high revs. The Cat Cams 4901804 profiles are priced at £527.12 excluding VAT and are available now, from all Cat Cams dealers including Pug1off. Please note: owners of the Citroen C4 VTS seeking extra performance can also benefit from fitting the Cat Cams 4901804 profiles as these cars also run the EW10J4S engine.